Apple’s AirPods are the best-quality wireless earphones I’ve used, but at over $150 for a pair you don’t want to lose yours! Apple’s has an elegant hard plastic case to store and charge the earphones, but it’s very small and slippery. 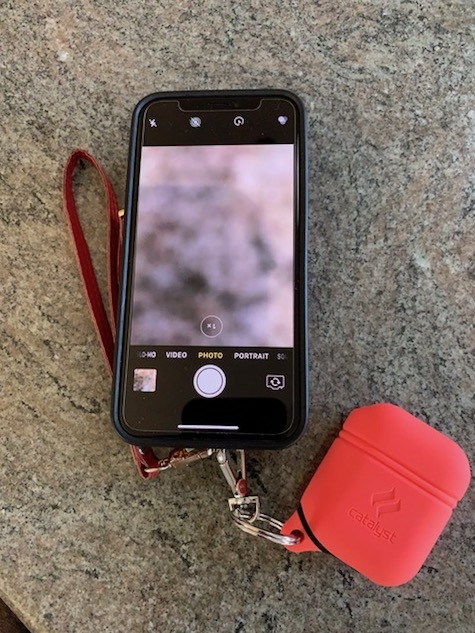 The Catalyst Waterproof AirPods Case fits over Apple’s case and is a great investment to keep your AirPods safe and handy. The Apple AirPods case fits perfectly inside the Catalyst silicone sleeve, which has a well-designed opening at the bottom to accept a Lightning charging wire plus a clever stretchy roll-down top to let you access your AirPods without removing the silicone case. 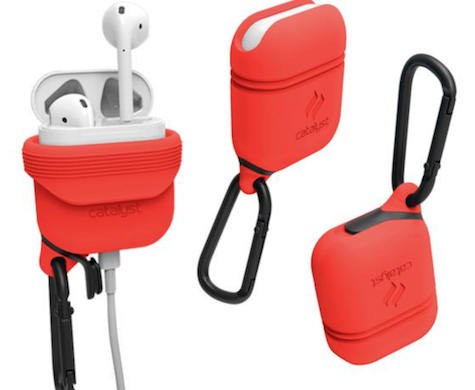 While you won’t want to go swimming with it, Catalyst’s sleeve will keep your AirPods secure and protected from scratches, splashes, and getting banged around. The Catalyst case is sleek and attractive, too, and you can choose basic black and a few fun bright colors. 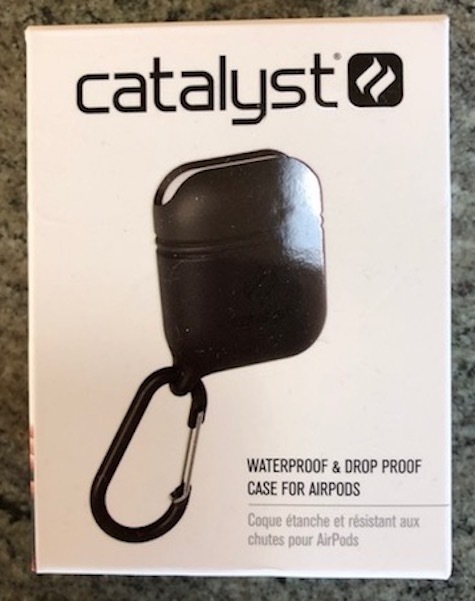 Catalyst Waterproof AirPods Case includes a removable carabiner clasp to use to attach the case to whatever you want – a backpack strap, your purse, or whatever. 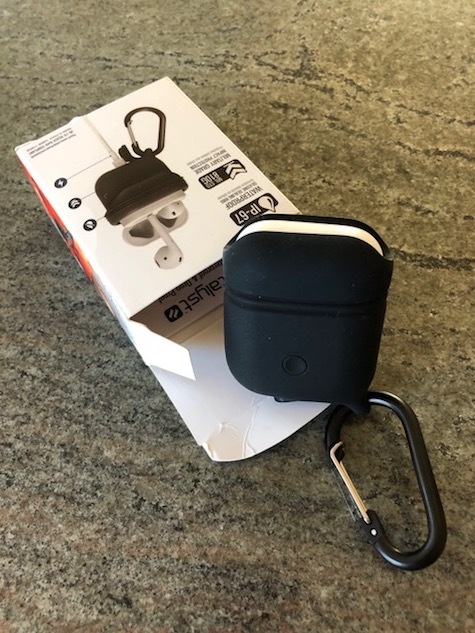 I keep my AirPods clasped to my phone case, which has a loop to hold a wrist strap that’s also large enough for the Catalyst carabiner. 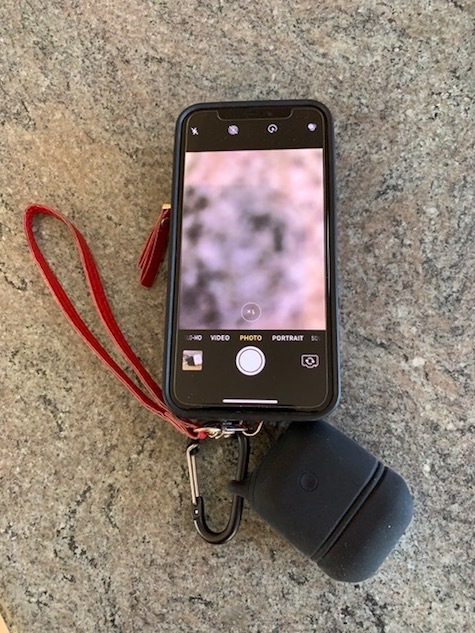 I have substituted a different, keychain-type clasp for the carabiner clasp to attach the Catalyst case to my phone; it allows the case to move more freely and is very easy to clip on or off. I am happy that Catalyst’s design allows you to substitute a different clasp for the one they provide, or even to wear your case on a chain or necklace. At $25 U.S. this is not a bargain basement case, and it looks and feels substantial. Design-wise, it’s a good partner for Apple’s premium priced, premium quality AirPod earphones. I’ve been using this case for several months and haven’t lost an AirPod yet despite nearly daily use. 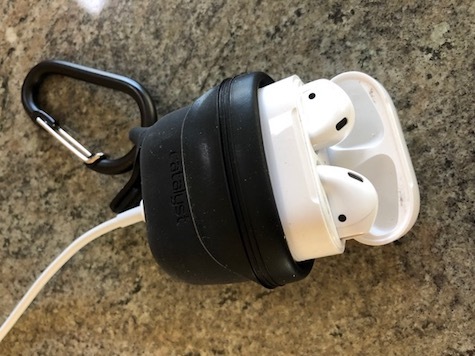 Catalyst Waterproof AirPods Case does not show wear and tear, and the critical moving parts that are stretched to access the AirPods or to charge them are not getting ripped or stretched out. It’s a great investment! Full top score 10 out of 10 MyMac Review Rating.